"Fortunately, no one was injured as a result of the accident," he told financial analysts in a conference call. "And based on the preliminary inspections that were conducted this morning at Wallops Island, it appears that the launch pad complex itself was spared from any major damage. In addition, the Antares Vehicle Assembly Building and related Cygnus spacecraft processing facilities at other locations within the Wallops area were not affected by the failure in any way." One natural suspect is the rocket's main propulsion system, powered by two Soviet-era engines originally built for a Russian moon rocket that later was abandoned after a series of in-flight failures. Engines left over from that program were mothballed, and Aerojet Rocketdyne bought about 40 of the high-performance powerplants in the 1990s. The renamed AJ26 engines were refurbished, equipped with modern avionics and exhaustively tested to ensure they were safe to fly. "We still have a lot of work to do in the days ahead to analyze all of the telemetry and video data, to review the recollections and notes of the participants in the operation and to collect all other available information about the flight," he said. "This investigation may, or may not, lead us to the conclusion that the failure was caused by a problem with the Antares first stage main propulsion system. "As most of you know, the AJ26 rocket engines used in that system have presented us with some serious technical and supply challenges in the past. So not withstanding the previous successful flights of Antares before yesterday, Orbital has been reviewing alternatives since the middle of last year and recently selected a different main propulsion system for a future use by Antares." Thompson said the company may decide "to accelerate this change if the AJ26 turns out to be implicated in the failure. But this has not yet been decided." As for how long it might take to figure out what went wrong, he said barring problems or major surprises "it will not likely take very long, I think a period measured in days, not weeks, for the investigation team to define the handful of most likely causes of the accident. It may take a little longer than that to zero in on the final root cause." Orbital Sciences holds a $1.9 billion contract with NASA to build and launch eight space station resupply missions to deliver some 20 tons of cargo and supplies. SpaceX holds a similar contract valued at $1.6 billion for 12 resupply missions using that company's Falcon 9 rockets and Dragon cargo ships. 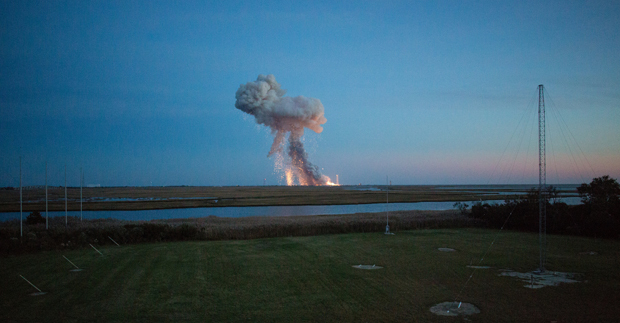 "From our experience in the past, which is not altogether transferrable to this situation, I would anticipate that there will be some delay in the next scheduled Antares launch," Thompson said. "I think a reasonable, best-case estimate would bound that at three months, but it could certainly be considerably longer than that depending on what we find in the review. I would hope it would not be more than a year." Asked if engineers had seen any clues about the cause of the failure in video or telemetry, Thompson said "the short answer is it's still a little too early to tell." But he said there were hints in the telemetry. "There are certain specific elements of data that have been preliminarily analyzed to date that point in a particular direction," he said, "but my experience also suggests that sometimes first impressions are not correct ones, and it's very important not to focus too early on what may at first appear to be the cause of an accident like this. "It's important to do a very comprehensive review and consider things that may at first not appear to be likely causes of a failure just to be sure you don't fixate early on on what initially appears to observers to be the likely cause and end up missing the real root cause. I think we will be substantially smarter on this over the course of the coming days, not weeks. I may be surprised, it may turn out to take longer, but my best guess right now, assuming we proceed in a very diligent and open minded way, we'll be zeroing in within a week or so on where the problem is likely to be found." In opening remarks, Thompson took time to remind analysts and others listening in that launching rockets is a challenging enterprise and "although they are increasingly infrequent in our business, rocket and satellite failures do still occur." "Building and launching vehicles into space are among the most challenging and demanding things that government organizations and private companies do," he said. "Despite the diligent efforts of some of the aerospace industry's best and brightest people, sometimes things do go wrong. "Second and more generally, Orbital has experienced adversity in the past, some of which was more difficult that this. And the company has always emerged stronger as a result. I am determined that we will do so again this time."